Who doesn’t love pool parties with summers around the corner? With the company of friends and waterproof speakers for the garden, there can be thrill, excitement, and loads of fun. Waterproof speakers fulfill a functional role and are designed specifically for outdoor use. These are the speakers that will work in spite of any amount of water thrown on it, even amidst temporary sinking. The best thing about these speakers is that these are specially designed to be immune to water; they are also capable of remaining unaffected when they are exposed to chlorine, heat, and dust. Hence, your friends and you can enjoy outdoor parties in any weather condition. The waterproof speakers ensure that you gain maximum sound output in every outdoor environment. These are the perfect choice for a poolside party, beach party, a boat trip or a rain dance. With the advent of technology, a wide range of waterproof speakers have entered the market but the question that arises is which one to buy? There are several things that one must consider prior buying speakers for outdoors. Durability: The speakers must be weatherproof along with being waterproof because these will not only be exposed to water but also to the other elements that include storms, extreme heat, and rain. Buy a good quality speaker that stays intact in all conditions and deliver excellent sound quality. Signal Transmission: If you are considering buying wireless waterproof speakers then signal transmission area becomes a very important consideration. Ideally, the signal should be strong enough to cover your entire backyard. All manufacturers clearly specify the range of their wireless systems. So, always prefer speakers with maximum signal range. Compatibility: Selecting a speaker that is automatically compatible with your music system is a good idea. You shouldn’t need to buy any adapters, connectors to make your speakers work. First, try to figure out the kind of port your audio system uses – whether it has dual inputs, or whether it uses a standard headphone jack. This will give you an idea of what to look for in a waterproof wireless speaker system. Price: Costly does not always mean that the product is worthy of buying. The technology is increasingly becoming cheaper. Hence, before buying, it is wiser to compare the prices that are offered by different manufacturers. 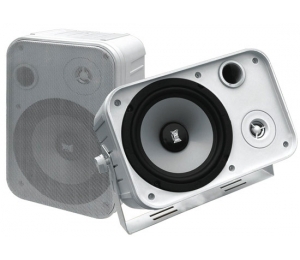 Garden Speakers: As we discussed above that these speakers are meant for your garden or patio area. These work in all the conditions, all weather, and are extremely durable for an outdoor use. Wall and Ceiling Speakers: These types of speakers are popular in bathrooms, kitchens, and saunas. These easily fit into the walls & ceilings to add to the beauty of the bathroom, or kitchen. Underwater and Floating Speakers: If you want your music to swim with you, then buying a floating waterproof speaker is a good idea. These waterproof speakers are wireless. Therefore, they can float up to a certain distance and still give an impeccable surround sound. The marine stereo and speakers have plug and play feature, you will not have to waste any time in the installation of the speakers. The measurement of the area is very important so as to get an idea about where we can place the speakers. Large speakers have the tendency to deliver better sound performance; one must try to find the largest space possible. The depth of the space behind the speaker should also be ensured so that the heat that is generated will be cooled down. Thus, the cables will be saved from melting. After considering all the above-mentioned points you can easily buy the best sound and recording equipment online. The online shopping sites have videos, tutorials and a wide variety of such speakers for you to select. Many of the sites also have discount offers on waterproof speakers. So, to get the best pool party experience or to tune into your favorite music while you are on a boat trip, always remember to buy the best quality speakers.